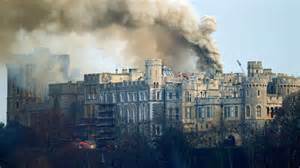 In November, 1992 a major fire destroyed major portions of Windsor Castle. The fire began in the Queen’s Private Chapel when a spotlight ignited a curtain, but it soon spread to several neighbouring rooms, and the major part of the State Apartments was soon ablaze. According to published reports, the major loss was to the core of the Castle. The false roof above St. George’s Hall in the Upper Ward and the void beneath the floors for coal trucks had allowed the fire to spread. St George’s Hall partially survived, with the wall largely intact, but with the ceiling collapsed. The State Dining Room and the Grand Reception Room were also devastated. Smaller apartments and over 100 rooms were damaged or destroyed in the fire. The seven most seriously damaged rooms had largely been emptied the previous day for rewiring. The Castle had just completed an 18-month phase of rewiring in most of the rooms destroyed. A major unprecedented restoration was undertaken, and the State Apartments reopened early 1993 after rewiring was completed; all major rooms were open by Easter, and only St George’s Hall and the Grand Reception Room remained closed at that time. Eleven of the fifteen principal rooms of the State Apartments were open, with two still undergoing long-term restoration, and two more completely destroyed. I love travelling through the English countryside, a big change from the dry, baron lands down here in OZ. Great pics! Thanks, Tommy . . . there seems to be beauty all around. I look forward to reading about your upcoming adventures and seeing your photos of Montreal and Hong Kong! Thanks! It was a great side trip from the London rush. Beautiful pic, I love travelling! Great place, I remember my visit many years ago! Nice to see the report from another point of view! I enjoyed taking your tour of Windsor Castle, it was very interesting. Looks like an amazing place in a beautiful setting. I almost feel like I have been there thanks to your description and photos. Thanks. Thanks, Brad . . . it was!! Nice pictures of the town! I’ll link to your article, if you don’t mind, since I only took a few photos of “up the hill.” Did you actually get to see the castle and the inside of the castle? Thanks for the referral! We were able to see only some of the interiors, but none of the private royal apartments. Thanks, I am glad you found it interesting. Windsor is definitely worth the trip! Good post, thanks. I visited Windsor Castle some years ago but I never visit the town so I have to go back there. Thanks for your comment . . . I wish I had had more time to roam through the Town!